First things first, thank you very much J.G. Burdette and Maryanne for the Versatile Blog Award nominations. J.G. Burdette writes a very enjoyable history blog. I’ve always like history and her posts delve deeper into the topic than what I remember. 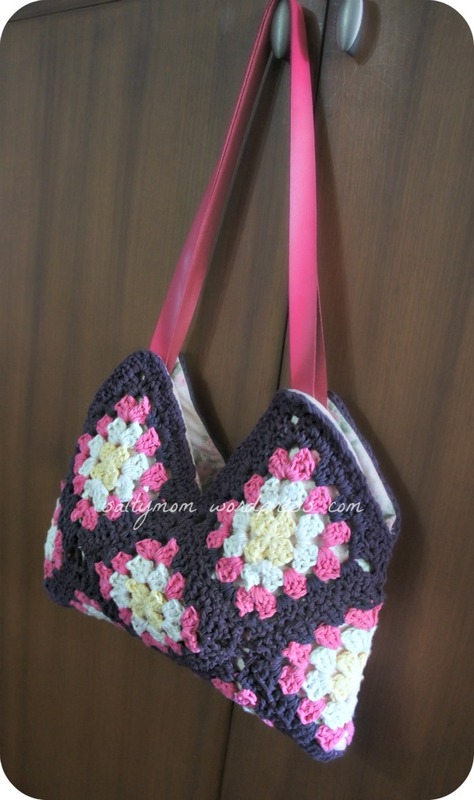 Maryanne’s crochet blog is always filled with happy colors. 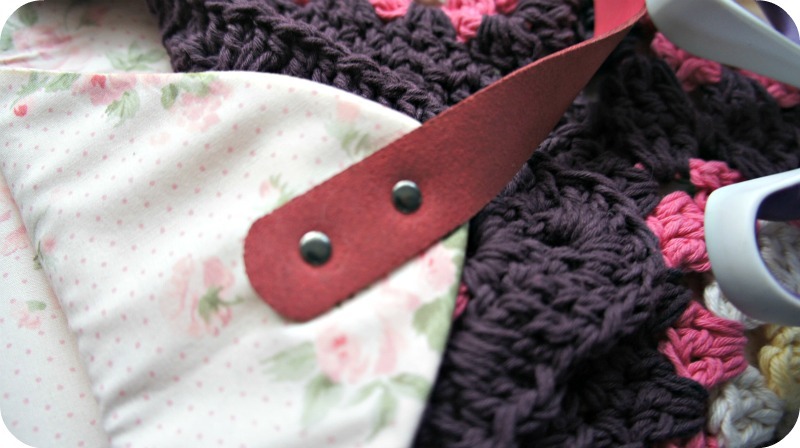 She also have a free pattern for a mug cape which is good for a beginner’s project. 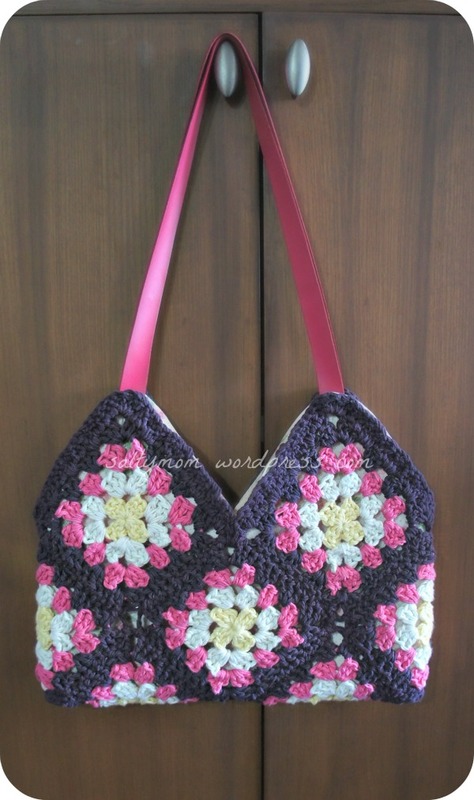 The granny squares bag has been completed for some time. However, concentration to write a post was almost nil with the husband watching episodes after episodes of “Spartacus” . All those face hacking, limbs a-flying, geyser-like blood gushing created much distraction when one is trying to write about a granny squares bag. umm, well, yeah , those bare-chested Spartans too ! Side view , with my regular stuffs inside. Nice n puffy. The magnetic snaps were inserted next to the handles ; it gives the bag more room and keeps the pointy top from flapping about. Now to continue on with this DIY tutorial, here are the steps from where I last left off. It’ll be mostly on setting rivets … and it’s going to be a super looooong post. 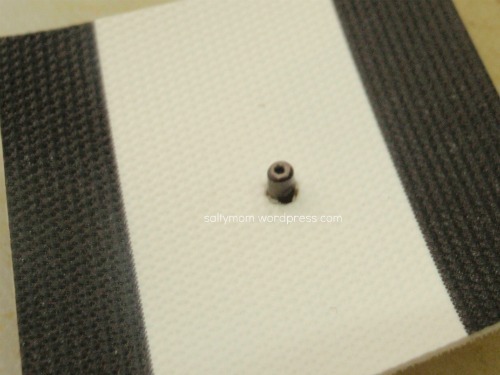 There are the single cap rivets and the double cap rivets. 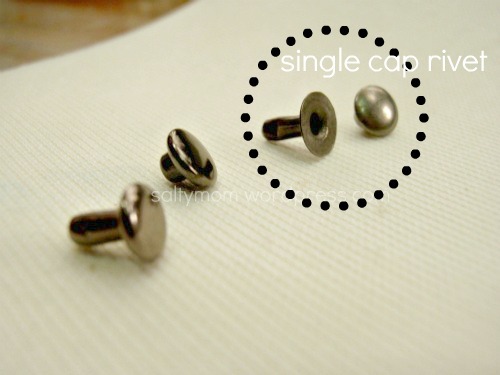 If the rivets are going to be seen on both sides, use the double cap ones. Also consider the thickness of the bag. It should match the shaft’s length so that after it is set, it stays snugly in place. 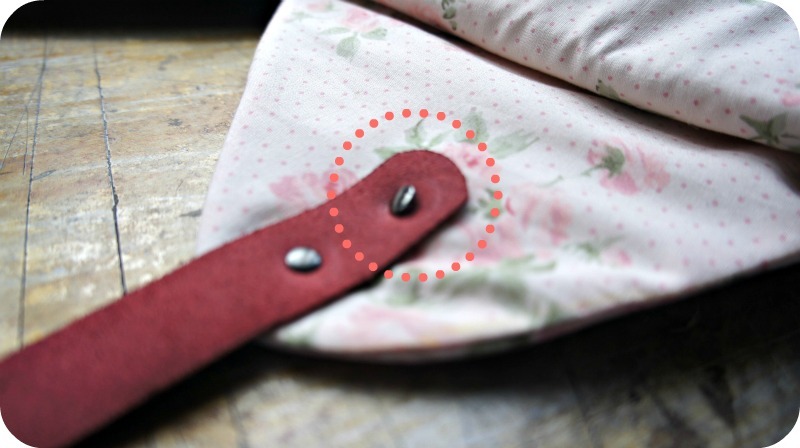 If your bag is on the thin side, you can add little squares of felt/interfacing in between to give the rivet some meat to hold on to. Both the setter and the anvil have a concave shape to keep the caps round. 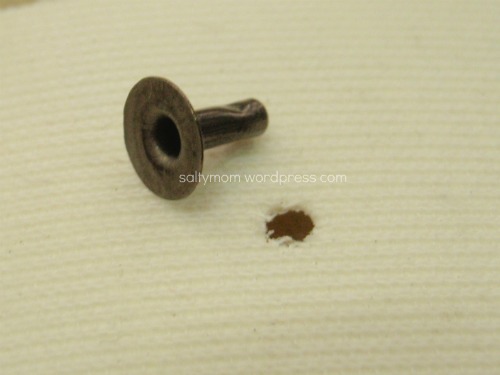 If you are setting single cap rivets, just turn the anvil over and use the flat side for the shaft and place the setter on the cap. 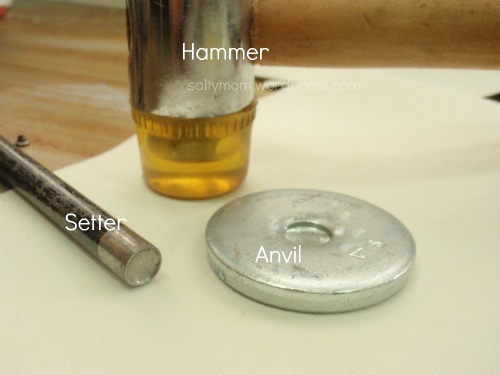 The setter and anvil come in sizes. I only have one set but was able to set smaller size rivets. Just make sure the cap is centered, and don’t pound too hard. The rubber hammer will keep your tools in good shape, undented. 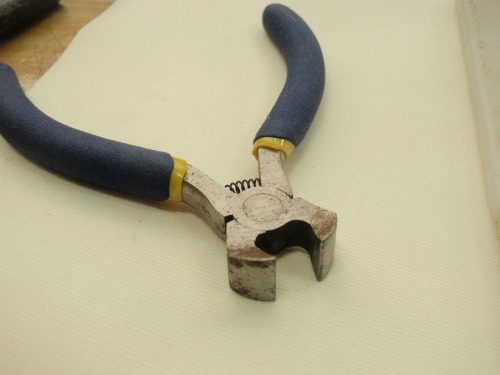 I’ve tried using a regular metal hammer on a hole puncher, with towels rubber banded onto it. Not a good idea. 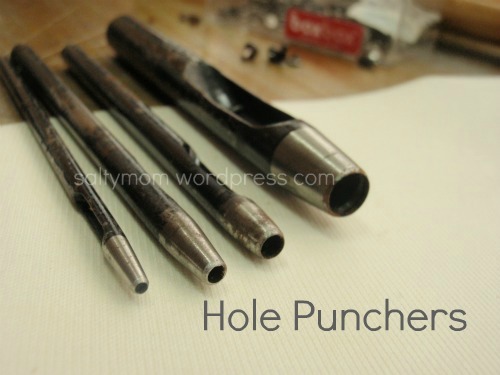 You will be punching holes through several layers of fabric or leather, so a hole punch is a nifty tool to have. Use one that matches the width of the shaft. 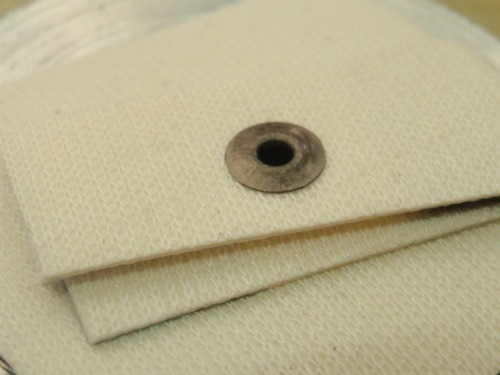 Don’t forget to protect your work surface when using these hole punches. … so that it is sticking out like this on the ” correct ” side. 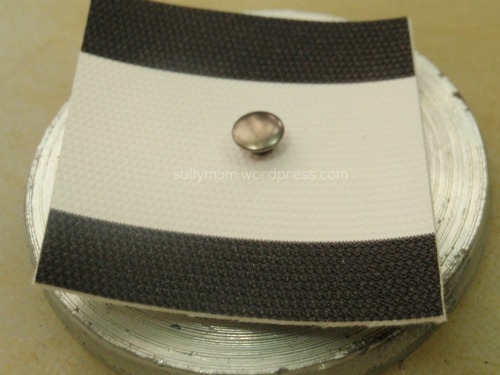 Then place the cap in place, there will be a ‘click’ sound if it is properly attached. Place the shaft side on top of the flat side of the anvil. Center the setter , and give it a pound with the rubber hammer. The underside will look like this, will all layers held firmly in place. Here are the rivets on my bag’s handles. 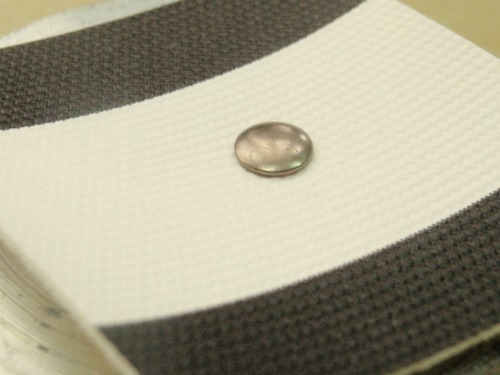 If you look closely, you’ll notice a faint ring left by the setter around the rivet. I need to buy more tools. Sometimes accidents happen. Nail clippers , scissors will not work, trust me. Use a chain cutter instead. 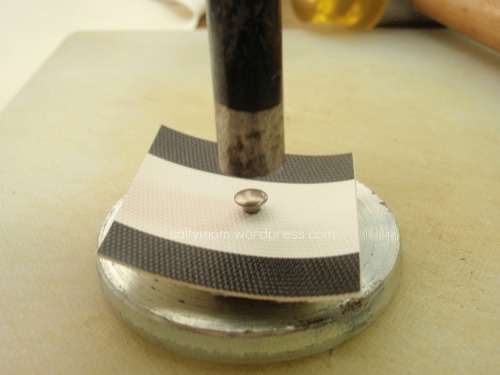 Even with this tool you will find how hard it is to cut a rivet in half. Remaining steps , after the handles are done, magnetic clips are set , and the opening in lining sewn up, I hand sew the crochet piece around the bag’s opening to the lining piece. End of my super loooong post. Next post will be a diy on a photo canvas wall. Till then, adios ! Your bag looks great. I like how you put the handle on too. Thank you ! I’m quite satisfied with the handles too as I got them a couple years ago and could not match them with any bags I make. I really like this bag, too cute!